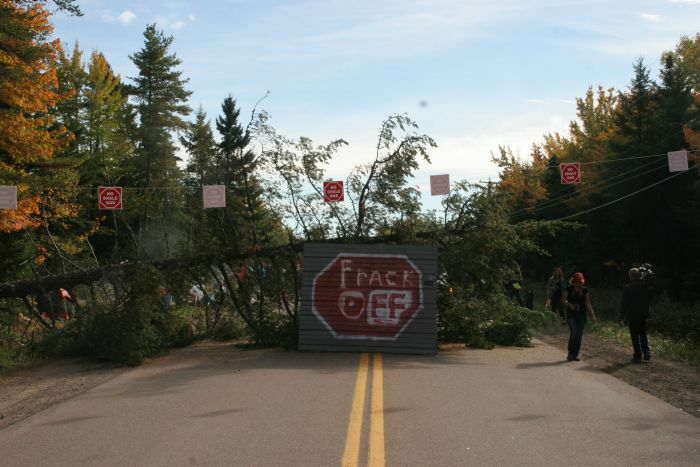 Rexton, New Brunswick – Anti-fracking activists in Kent County, New Brunswick have responded to last night’s RCMP-imposed block of both sides of highway 134, near the off ramp of highway 11, by creating an inner road block of their own. Members of the Mi’gmaw Warriors Society, an independently-run group that self-describe themselves as a ‘Homeland Security’ force, have felled several pine trees and are in the process of lighting fires along the highway. One van and numerous pine trees now also block access to the Irving-owned, gated compound that currently houses five of SWN Resources Canada’s seismic testing trucks, or ‘thumpers’. The thumpers are perceived by the activists to be a key piece of SWN’s equipment, without which the Texas-based gas giant will be unable to continue seismic testing in New Brunswick. Warriors build fire on road. Jim Pictou of the Mi’gmaw Warriors Society notes that this action is a direct response to the RCMP moving their line of police cruisers closer to the make-shift encampment earlier this morning. 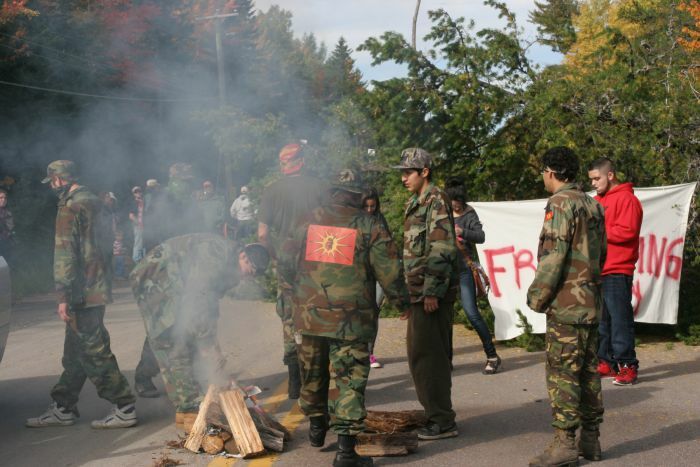 Posted on September 30, 2013, in Oil & Gas and tagged fracking New Brunswick, Mi'gmaw Warriors Society, Mi’kmaq, New Brunswick shale gas protests, SWN Resources Canada, Warrior Society. Bookmark the permalink. 5 Comments.